People who stop by will be able to use simulation to “build a prosthetic are, dissect a human heart or design and customize an electronic circuit.” The presentation will show some of what’s possible with virtual reality and new technology. This entry was posted in Announcements on August 29, 2016 by nluebke. As the new school year gets underway, returning students will notice some changes, both in the physical surroundings and faculty and staff. One of the changes is that the library is now a Quiet Zone. 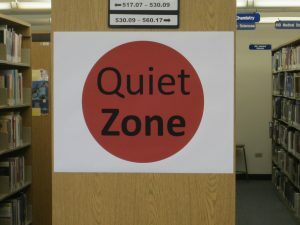 In an effort to support students who want to study in the IRC, everyone must now be quiet in the main area of the library, where numerous “Quiet Zone” signs are now posted. Students who wish to study with others or need to discuss a project or paper, should head to the back of the library where the printers are, to talk quietly among themselves. There is a Group Study Room, which students can reserve. Please ask a library staff member for the sign up sheet to reserve the Group Study Room. In recent years, there have been frequent comments on the annual IRC survey about noise in the IRC. Please be respectful to classmates who have come to IRC to study and be quiet while you are here or go to a public area outside the library to talk freely with others. This entry was posted in Announcements on August 16, 2016 by nluebke.